An emotional Lewis Hamilton said his prayers were answered after capturing one of the most remarkable victories of his Formula One career. 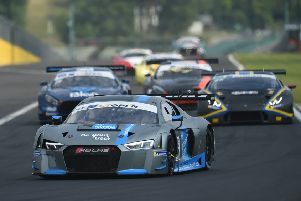 The 33-year-old Englishman started only 14th in Germany following a mechanical failure in qualifying, but after he scythed his way back through the field, he then took advantage of a dramatic rain-hit conclusion which involved his championship rival Sebastian Vettel crashing out from the lead. Hamilton leapt from his Mercedes machinery before jumping into his sea of mechanics as he celebrated a win, described by his race engineer Pete Bonnington as a “miracle”, and one which has moved him 17 points clear of Vettel. On an extraordinary day, Hamilton’s victory then hung in the balance for close to 90 minutes after he was hauled in front of the stewards for aborting a late pit-stop, cutting across the grass, and re-joining the track. The question was whether he had done so in an unsafe manner. But after explaining his version of events with team manager Ron Meadows to the officials, the Briton avoided a timed penalty, and was handed only a reprimand to ensure the 66th win of his career would not be chalked off. 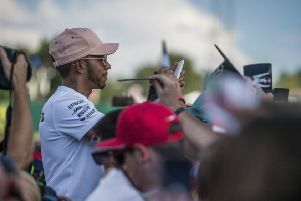 It capped a whirlwind 24 hours for Hamilton, who was booed by the partisan German fans before the race, with the heavens dramatically opening as he stood on top of the podium. Hamilton looked to the sky and spread his arms out wide. “It has been the most emotional day,” Hamilton said. “I have never had a race like this. I woke up this morning and you always have to have the belief that it is possible. “I prayed as I always do before the race, and my prayers were really answered. It has freaked me out a little bit more than normal, particularly with the biblical storm afterwards. “In England I didn’t remember hearing the fans booing the drivers, but here there was a lot of booing for me. “I kept seeing a couple of different British flags among a sea of Ferrari red. “That was so positive for me, and that is why I said that love conquers all. Indeed, what a difference a day makes. On Saturday, Hamilton was slumped over his car after he broke down in qualifying. But yesterday, he did not put a foot wrong. From 14th, Hamilton was in the points after just four laps. On lap 14, he passed the Haas car of Kevin Magnussen for fifth, and then began his pursuit of catching the leading pack. By this time, Vettel was already 25 seconds up the road. While his rivals stopped for fresh rubber, Hamilton remained on track in the hope that the forecast rain would arrive. But on lap 42, Hamilton’s rubber was in tatters and he had no option but to stop. A little less than two laps later, a light sprinkling arrived. Hamilton was revelling in the slippery conditions and, at one stage, was three seconds faster than anyone else. Then, with just 15 laps to run, Vettel was in the wall. The Ferrari driver had spectacularly crashed, and he was out of the race. Valtteri Bottas and Kimi Raikkonen stopped for new tyres after the safety car was deployed, but Mercedes were unsure what to do with Hamilton. They told him to pit, but at the last minute Hamilton veered left from the pit entry. He was in the lead, and, despite a slap on the wrists from the stewards, it proved the right call. When the race resumed, Mercedes held their breath as Hamilton and Bottas went wheel-to-wheel for the lead before they called off the fight as the team sealed a one-two finish. Vettel, meanwhile, insists he will not lose any sleep despite crashing out and handing advantage to Hamilton. Vettel got out of his Ferrari cockpit, and trudged across the gravel, kicking his right foot at the sand in frustration. The glum 31-year-old then apologised to team principal Maruizio Arrivabene before sheepishly making his way along the remainder of the Ferrari pit wall to say sorry for his error. “It was a huge mistake and it had a huge impact on the race because we retired,” Vettel said. “But it is not like I will have difficulties to fall asleep because (of) what I have done wrong.